Many people are now mulling over the idea of purchasing a new smartphone and the three leading candidates are HTC One, Samsung Galaxy S4 and Sony Xperia Z. But which to choose? Next to design and hardware, one thing to take into consideration is the user interface which plays a big role when choosing a headset. For your reading enjoyment, I've put together a comparison of the Sony and Samsung interfaces to aid you in any future purchasing endeavors. Tip: On the left side, you will always see the Sony interface while Samsung's TouchWiz is on the right. Sony and Samsung both got decked out with great looking lock screens complemented with non-fussy operation. Sony offers quick access to music and the camera while Samsung has added widgets. This was made possible thanks go Android 4.2 that the Galaxy S4 is based upon. The Xperia Z still runs on Android 4.1, therefore it doesn't offer the same options. The home screens for both systems are built in a similar manner: you can add apps and widgets and delete and rearrange your home screen pages. Performing the usual pinch-to-zoom gestures will bring you to the home screen overview. Here, TouchWiz shows mini pictures of all its pages all at once. With Sony you'll need to swipe through each home screen page individually. Other than this element, the two home screens have received similar compositions. The devil is in the detail when it comes to today's comparison since both Sony and Samsung have a very close look in terms of their notification bar, or at least at the first glance. Right at the very top you'll find the quick settings which you can switch on and off with a finger tap. Your own notifications will appear underneath. Sony's interface is more sleek-looking than the one belonging to Samsung since TouchWiz offers an additional display brightness adjuster. Not only that, it will also let you rearrange and modify the quick settings at leisure. The app overview with both manufacturers is again very similar. Sony as well as Samsung adopted the horizontal lists that are stocked full of apps for you to swipe through. These can be arranged and organized using various criteria (alphabetical, most used, recently downloaded...). TouchWiz offers an extra tab row on the top bar that allows you to switch widgets, built-in and downloaded apps in and out. Samsung has enriched its recently-opened app page with three extra buttons that not only offer quick access to task manager and Google Search, but also lets you end all open apps with one simple action. Sony presents a list of mini apps instead that can be placed in the foreground of your screen. These always at your disposal. While the look and functionality of Sony's settings are almost 1:1 with stock Android, Samsung has spread its options out in multiple categories which can be reached by going through the various tabs. The aim was to create a clearer overview of the settings, but in fact they achieved just the opposite. At the end of the day it's always a question of what you’re willing to get used to. Sony's focus puts an emphasis on the fact that its smartphone is ''smarter''. Whether it be the Walkman, many helpful apps like Smart Connect that help with NFC and other accessories or the integrated backup solution, all of these extra apps are practical and offer a much more valuable user experience. Samsung went with the motto ''as much as possible'' without actually checking to see if some of the features are actually useful in everyday life, like Eye Scroll for example. Again, you need to be the judge of what is most important here. 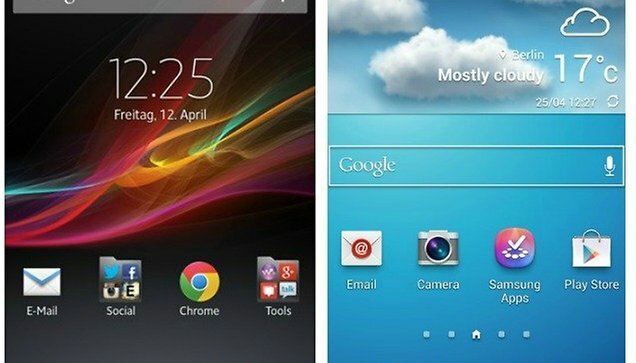 Sony Xperia and Samsung TouchWiz are both very similar and only differ in the smallest of detail. Samsung has more functions and bright colors. Sony has that darker elegance, paired with a minimalistic touch. Both manufacturers did a great job in creating an optically-appealing interface, therefore your choice should be based principally on design, optics and material preference. My personal favorite was the Sony Xperia UI because I found it be just a smidgen better due to the fact that it's less cluttered and has a clearly more homogeneous presentation.